Definition: blueberries and ricotta cheese sweetened with a touch of sugar. Ricotta cheese & blueberries are a great alternative to your usual yogurt and fruit in the morning. Turning this combination into a cake makes for a perfect summer, backyard dessert. When rennet and cultures are added to milk, they cause unique milk proteins called caseins to come together and form a network that traps fat. What's left behind is a yellowish liquid called whey, which contains mainly lactose, lactic acid and whey proteins. To make ricotta, this whey (preferably sweet whey) is immediately heated up to 80-90 degrees C for a short period of time to destroy the lactic acid bacteria, thereby preserving the lactose and sweetness of the final cheese product. Whole milk or cream is commonly added to whey to create a more creamy and smooth ricotta. Heating also servers to completely denature or unfold the whey proteins and promote their association with caseins. Finally, vinegar or lemon juice is gradually added to the fortified whey with gentle agitation to coagulate the proteins. The mixture is held at 90-95 degrees C for about 15 minutes without stirring before skimming and draining the floating curds - et voila, Ricotta! 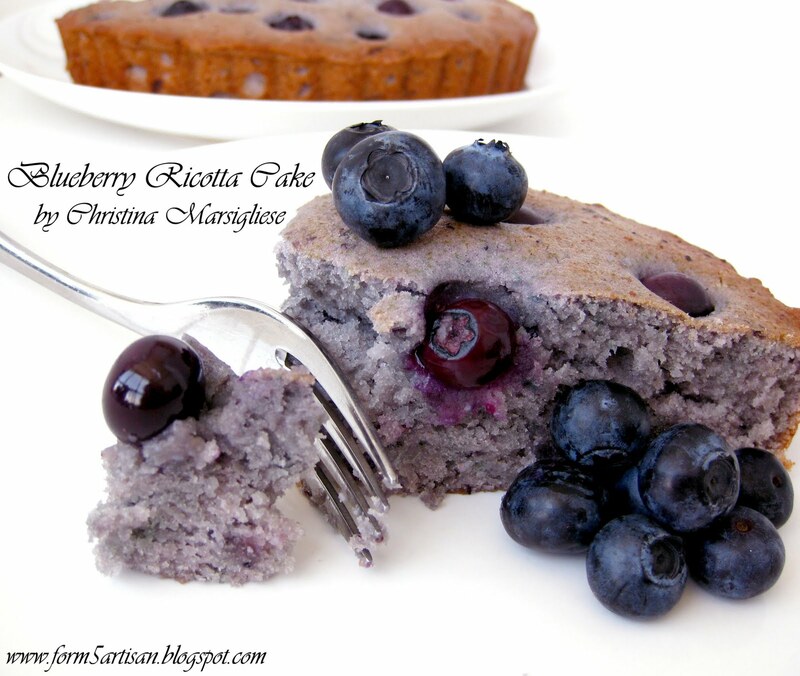 Ricotta not only adds a subtle creamy cheese flavour to this Blueberry Ricotta Cake, but it keeps it very moist and slightly dense. 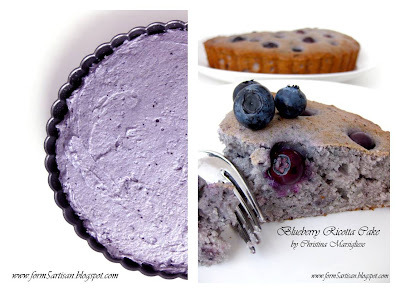 The blueberries tint the cake a dreamy shade of blue. Be sure to get your blueberries when they are in season, preferably from a local farm, in order to extract the best colour and flavour. Hey! Thanks for checking out my site! I love the information you provide with your post. I wanted to do food science once, but the thing is I'm so weak at science, I would've failed half way! haha. Now I know your the blog to go to, to simplify my questions about food chemistry! Yay! I dont know if my comment went to the right page - the site redirected me to the brownie cake - but I made THIS one today and its fantastic! Thanks Sarah! I'm glad you enjoy it! I find it to be the perfect backyard patio dessert, yet it also suits afternoon tea. That looks so delicious. I've been wanting to make my version of blueberry cake now.